We have had an exceptionally mild winter (2011-12) here in my part of Nebraska. We are getting rain instead of snow. We had a family campfire at Christmas. Hubby was even running the irrigation pivot in January in order to get some much-needed moisture into the soil for our pastures and newly-seeded grass. Hubby recently asked me “When are we going to pay for this nice winter?”. My reply was “I think we already did–the past two winters.”. Winter 2009-10 and 2010-11 were no fun here on the farm. We had snow drifts 10+ feet high in our trees and covering fences. Snow covered all the forage, so we (and by “we” I mostly mean “hubby”) had to bring feed to the cows. Occasionally, I have stepped in to be the surrogate cow-feeder–with mixed results. The mild winter 2011-12 means that the cows can get their own feed--and this farm wife doesn't risk her life driving hubby's red tractor. Hubby’s off-farm job is in sales which requires him to be gone overnight from time to time. Because of my dislike for our old International 1086 tractor (which goes way beyond its red color), hubby tries hard to minimize my interaction with “Old Red”. However, even his extraordinary efforts cannot completely keep us separated. A couple years ago (first on my list of yucky winters above) he left for an overnight trip. 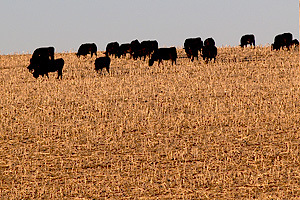 The cows were out on cornstalks. They had access to water, and had been given plenty of supplement, so he did not think I would need to do chores at all. Unfortunately, hubby did not check the weather forecast, which included a winter storm. A few years earlier, we experienced a near marriage-ending event involving loose cows in a blizzard. (I was totally right for wanting to bring them home BEFORE the storm.) Ever since, the “bad winter weather” checklist has included bringing the cows home to multi-strand, non-electric fences with access to hay bales as well as the shelterbelt (trees) to keep them warm and fed. On this particular afternoon, I saw the weather forecast, consulted hubby over the phone (OK, maybe I didn’t “consult” as much as I “lectured”), and decided to prepare for the blizzard. The kids were too young to be left alone then, so I needed to get done before they came home from school and before I had to pick up the youngest child from daycare. Resigned to using a few hours of vacation time from my job, I fired up the pickup truck and filled some buckets with distillers grains (my kids call it “cow candy”) to lure the cows from the neighbor’s cornstalks back to our pasture. The cows totally bought the act and I convinced 70 cows to follow 5 buckets of distillers grains–[evil laugh]. I closed the gate, which meant the cows were locked onto our property. Step two was to feed them. I had two choices. I could make about 40 trips with the pickup carrying 5 gallon pails of distillers grains and loose hay or fire up the 1086 tractor and make two trips with hay bales and large scoops of distillers. I flipped a coin and, after flipping many more times, the tractor option was the grudging winner. Hubby had warned me that the shortest path from the hay pile to the shelterbelt (where the cows were confined) was icy and should be avoided. He recommended that I go a longer way around which winds slowly up the hill. This was necessary because the tractor was only two-wheel drive and he had not put the chains on the back wheels yet (chains provide a LOT of extra traction in icy conditions). I followed most of my instructions dutifully. I went up the hill using the long winding trail and did not attempt to put the hay bales deep into the shelterbelt–opening the gate and dropping them, along with the “cow candy” just inside the paddock. On the first trip I followed the long path down the hill. On the second trip, I was more confident, but still went up the hill the long way. After the second batch of feed was delivered successfully, I noticed that I was running out of time. The kids would be home soon. As I gazed down that hill, it occurred to me that going down the icy hill should be much easier than going up–shouldn’t it? Decision made, I pointed the tractor down the hill. To be safe (ha-ha-ha-ha), I shifted down a gear. Very quickly, it become apparent I had made the wrong choice. The heavy back end of the tractor began to slide down the hill at a much faster rate than the lightweight front end. I attempted to steer in a way that kept the front end of the tractor in front of the back end, but anyone that has driven an International 1086 knows that is easier said that done. Soon, the tractor was sliding sideways down the hill. At this point, I panicked and began to wonder how long before anyone thought to look for my body out here in the pasture…. Fortunately for me, the icy hill was so icy that the tractor did not tip over but came to a stop halfway down with the front end pointed up toward the top of the hill. The tractor had broken a small tree (in my defense, that tree needed to be cut down anyway to let the pivot move through that area), but a quick inspection revealed no apparent damage to the 1086. I climbed in, took a deep breath, put the tractor in reverse and slowly backed the rest of the way down the hill. Not long after this incident, hubby started talking about getting a new tractor….OK, he wanted a new tractor long before that incident, but I was a lot more willing to listen to his reasoning after that. We haven’t replaced “Old Red” yet, but I’m still holding out hope his replacement will be easy for me to drive (i.e. “Green”). A scary moment when You and Old Red were sliding on ice downhill. Darn happy that it came to a safe stop. Thanks for the kind words Doug. It was scary, but I can laugh about it since I got lucky and wasn’t hurt. 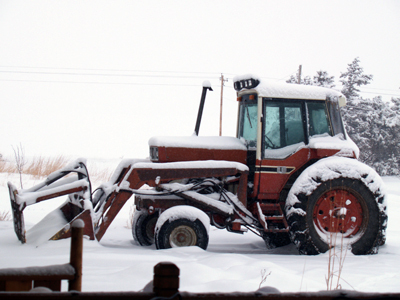 I definitely pay more attention to safe tractor driving habits in winter now. Great story! Go for the green one, for sure.